Assume that one of your friends on Facebook is very chatty and most of the posts on your wall are dominated by your friend. You watch the chatty updates for few days and on one fine day you decided to hide/block their updates on wall. Several months later assuming that the friend is less chatty and you want to unblock the person. How do you do that? Step 2: Click on the link “Edit Options” on the right side section of the screen. It opens a dialog box with the list of blocked friends, applications and pages. Step 3: Click on the Remove icon(small x symbol) next to each blocked person/app to unblock. 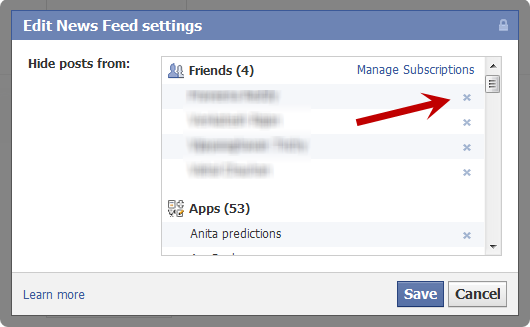 « How to disable the Social Reader Application in Facebook?